For the softest, fluffiest, silky, flea free fur coat. They won’t be able to keep their hands off of you! 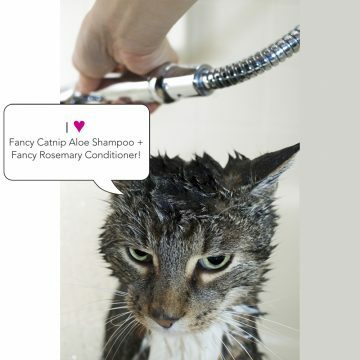 Get the ultimate in cat bathing luxury with Fancy Catnip Aloe Shampoo & Fancy Rosemary Conditioner. Specially formulated to soothe your kitty’s skin, Fancy products are graded for human use and contain no lanolin, pennyroyal, pesticides or citrus that can damage a kitty’s delicate skin. Who said catnip was just for toys? Now you can enjoy your favorite scent at bath-time too! The blend of natural botanical extracts will leave your fur shiny and silky without stripping or drying your sensitive kitty skin. You’ll be simply purring over your soft and fluffy fur. 8 oz with an easy use dispenser top. Contains Catnip (Nepeta Cataria) Essential Oil. Kitty, you’re already wet, so why not take the final step? Follow your cat shampoo with Fancy Rosemary Cat Conditioner to discourage those pesky fleas. The herbal rosemary infusion naturally repels fleas and the natural botanical extracts will add extra shine to your fur. Flea free and silky soft – you’ll be so irresistible they won’t be able to keep their hands off of you! 8 oz with an easy use dispenser top. Contains Rosemary Essential Oil.